The heat is still on and I am still in no mood to toil in the kitchen over the stove making elaborate dishes. I know that in the recent past I have shared with you all, a recipe of Prawn Biryani. But the steps involve par boiling the rice and making it in two parts. 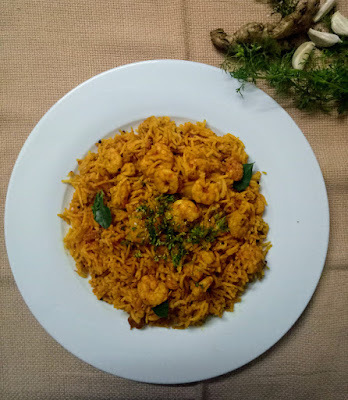 Today I tried out a prawn pulav that went quicker and yet was equally delicious. 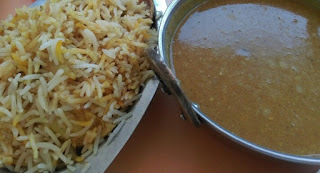 What I used were a few basic south indian spices and some sambhar masala. You can use Garam Masala too. 1. Take a heavy bottom pan, preferably a pressure cooker. Add oil and make it hot. 2. Add mustard seeds and curry leaves and sauté for a minute. 3. Now add ginger garlic paste and pureed tomatoes to the oil. 4. Sauté till tomatoes are cooked, now add all the dry spices and potatoes. 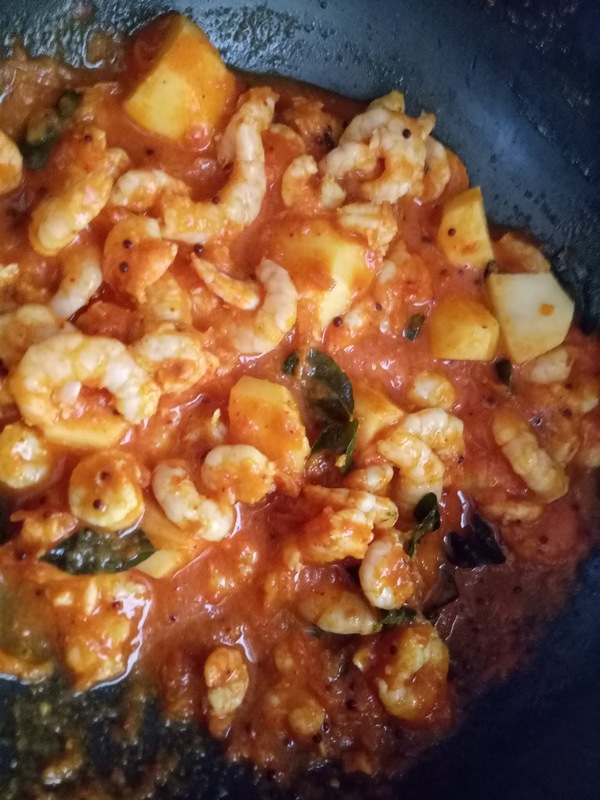 5.Add prawns and keep stirring for two minutes. 6. Add the washed rice and salt, mix well. 7. Now pour in 2 cups water and cover to cook till prawns and rice are completely done. 8. 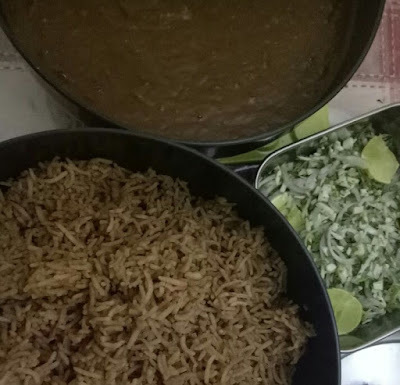 Garnish with fried onions and coriander leaves. 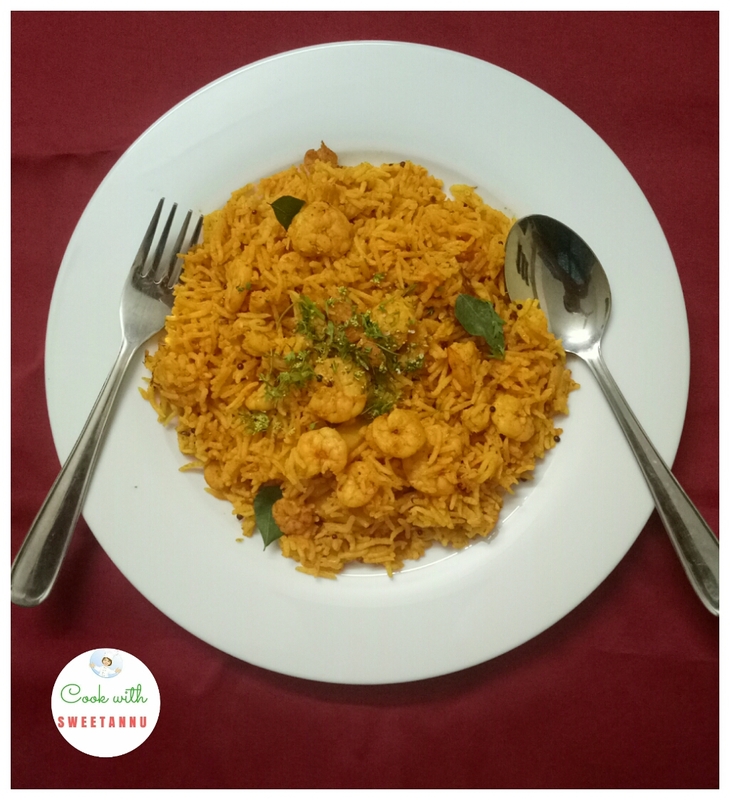 You can add coconut milk to the preparation along with the prawns for a more authentic taste. Or even try this recipe with boneless chicken. Its been ten days now, my maid Sujata has gone to her village. However much I like to cook, the prep of cutting vegetables and washing after cooking is not what I like to do. 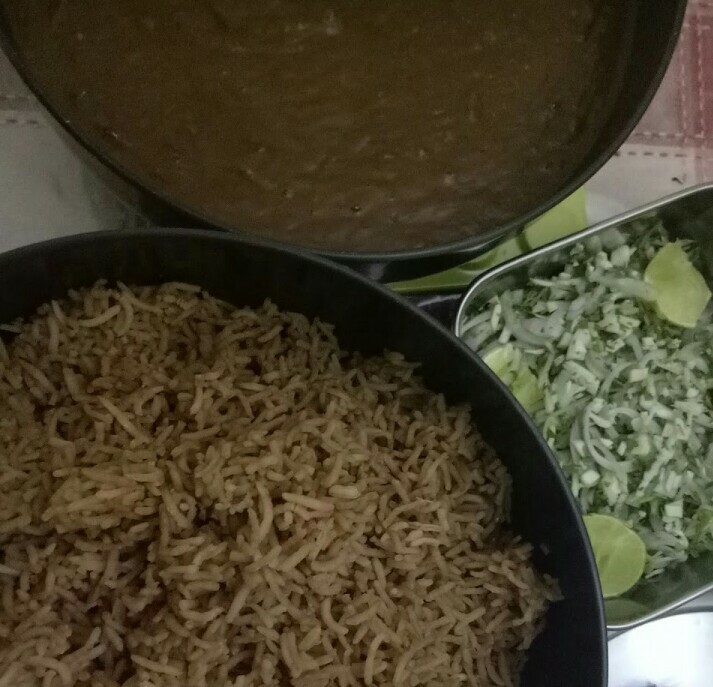 So I am being a real chor in the kitchen these days and taking short cuts. This morning, I just got up and impromtu decided to cook as early as 9 AM. Rummaged my refrigerator to find I just had a block of paneer and no veggies besides onions and tomatoes. The deep fridge has some frozen peas. 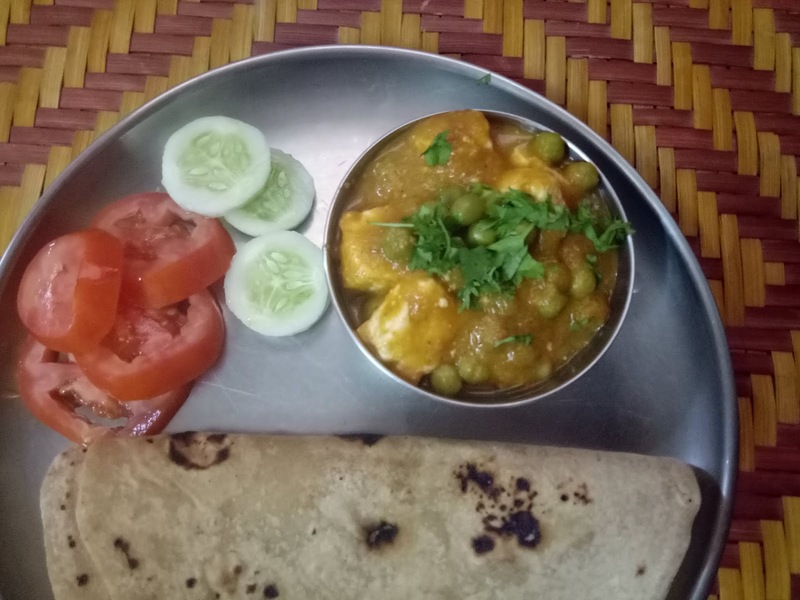 So I decided to quickly do a Matar- Paneer. 1. Add oil in a pan, into it add finely chopped onions and saute for few minutes till translucent. 2.Add green chillies, ginger garlic paste and saute for few minutes until raw smell disappears. 3. Add chopped tomatoes to it, saute for few minutes. 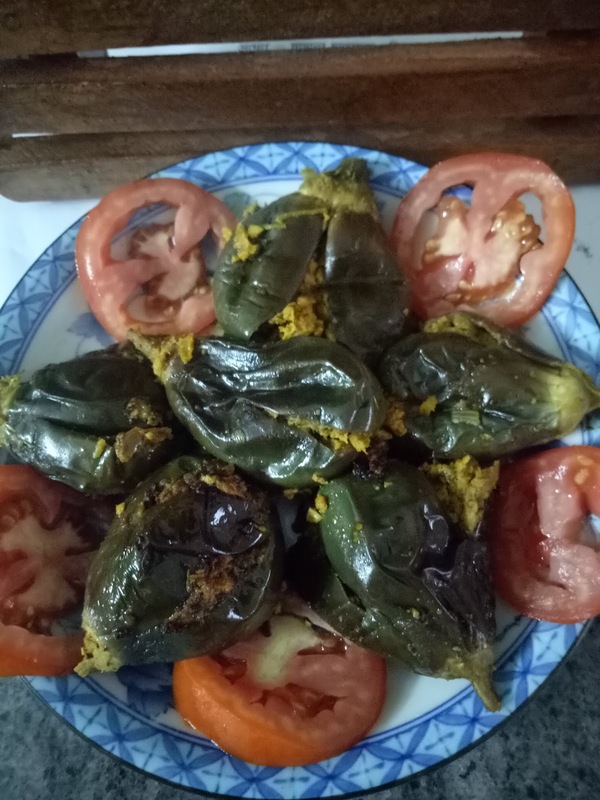 4.Add salt, red chilli powder turmeric powder, mix well and cook until the tomatoes till oil leaves the side and tomatoes are cooked. 5. Now add this mixtur into a blender and blend into a fine smooth paste. 6. Cut one inch pieces of the paneer. 7. 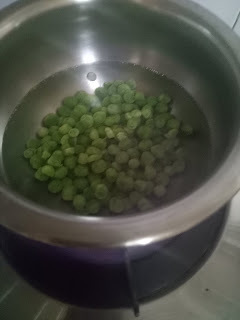 Also boil the peas for five minutes and strain and keep aside. 8.Take a pan, add oil to it. Now add curry leaves and let it splutter. 9. 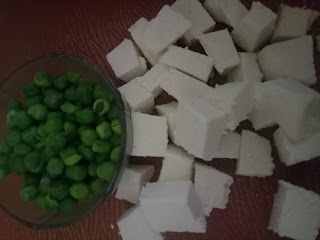 Add the onion tomato puree, boiled peas and paneer cubes. 10.. Let it cook on slow for 5 minutes. 11. Check for salt, add if you feel its less. 12. Garnish with corriander leaves. 13. Serve hot with roti and salad. Now isn't that an easy dish. Just pray that Sujata is back soon and I enjoy cooking up more tasty dishes. 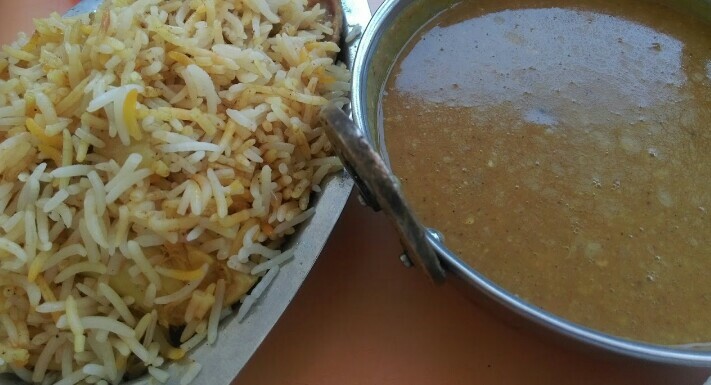 I have been getting many requests from my vegetarian foodie friends to share a veg version of the dhansak daal. 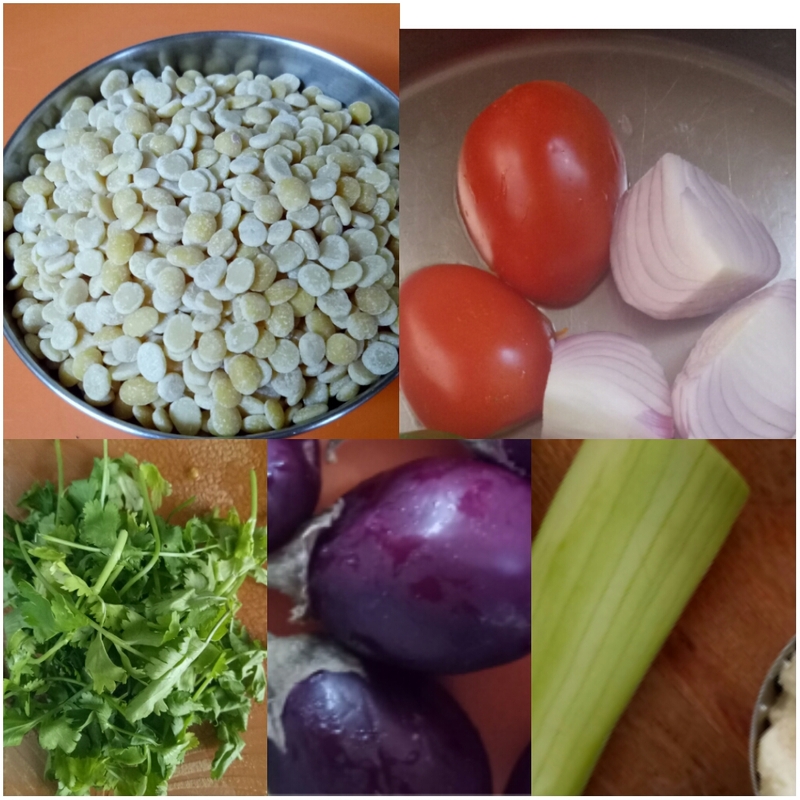 So here I am today to cook up an equally tasty vegetarian masala dhansaak dal you can savour with brown rice and chaccumber. There is alot of nutrition value in the dal due to the added vegetables so don't strain out the dal after boiling to retain all the fibre. 1. Wash all the dals and let it soak for an hour minimum. 2. Chop the veggies except onions and add to dal with salt, turmeric powder, green chillies and ginger garlic paste. Add enough water to let them veggies be soaked. 3. Pressure cooker this for three to four whistles. 4. Let the cooker come to room temperature, open lid and grind all of this to a paste. 1. Heat ghee in a pan, add finely chopped onions and saute them till they become transparent. 2. 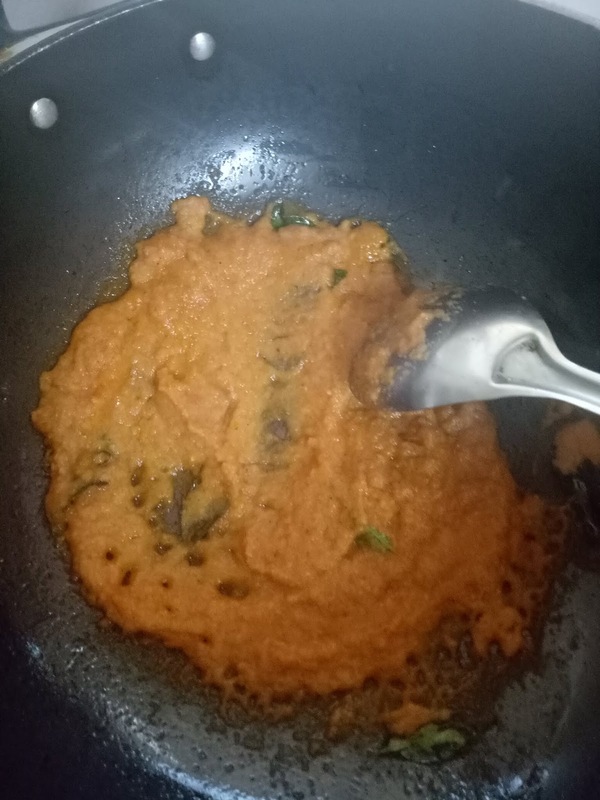 Add the dhansak masala, red chilli powder, garam masala and saute it for 3-4 minutes. 3. Now add the lentils and veggies blended paste mixture. 4. Let it simmer on slow flame for a 5-6 minutes and then add the tamarind paste. 5. Let it thicken, add a dash of vinegar and sugar. 7. 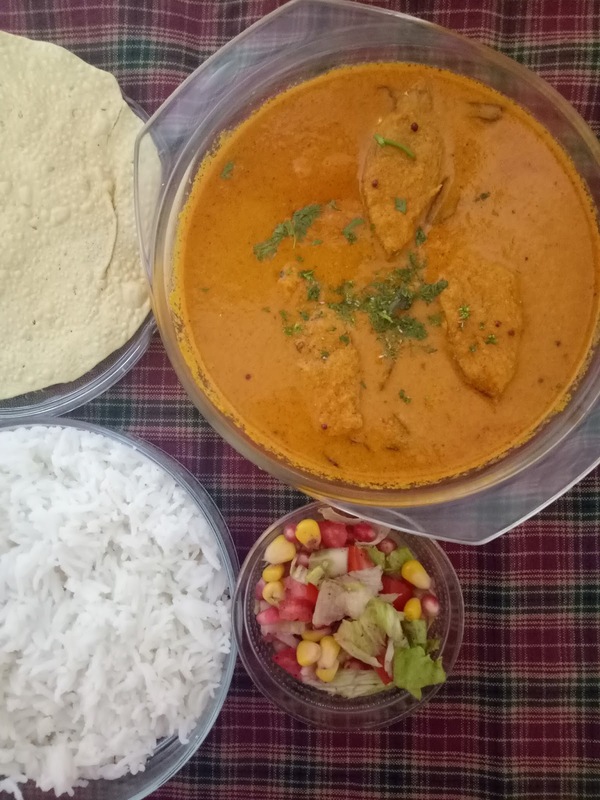 Serve it with a onion/cucumber/ tomato salad and brown dhansak rice. Toh kuch meetha khane ka din hai! The craving to indulge into something sweet has made me try out two desserts. They both are low cal, healthy and fruity. Smoothies are very refreshing this weather. 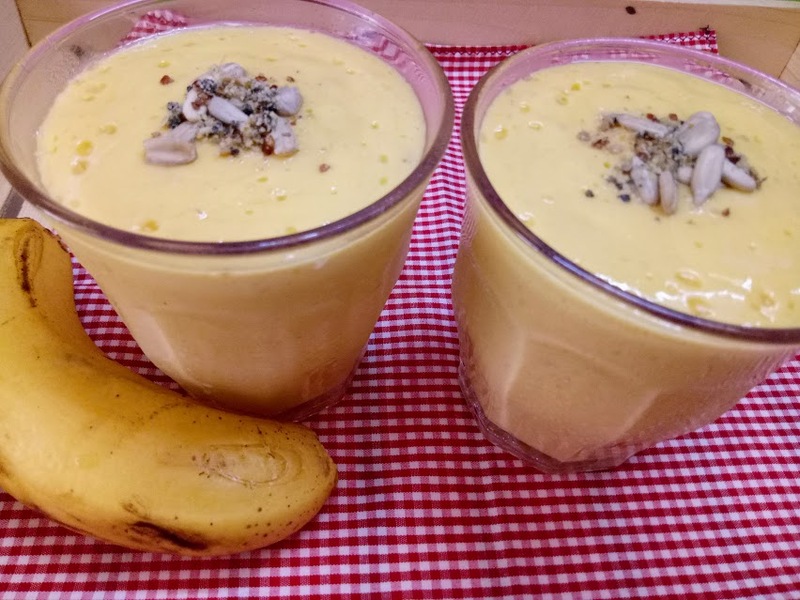 First I tried a Mango Banana Smoothie made with fresh mango, banana, honey and milk. You can use yogurt instead of milk. You can add more milk, but I like it like a thick shake and very fruity. 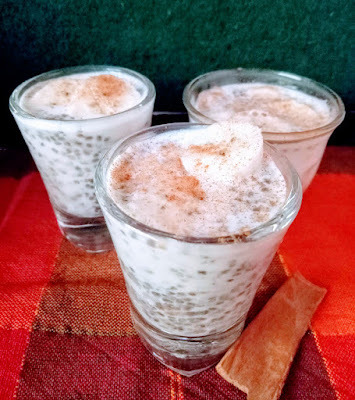 The second dessert is a protein chia seed shot made with chia seeds, dates, milk, almond powder and banana. 1. Take two mangoes, wash peel and remove the pulp. You can blend it in a mixer or do it with your hands. 2. Chop up the banana, now combine the milk, mango pulp and banana. 3. Put this all in a mixer and blend well. 4. Pour this in glass and top it with pumpkin seeds and some pistachio powder. 5. Keep it in the chiller for some time before serving. 6.You can use yogurt instead of milk. 7. If mangoes are not sweet sugar can be added but I avoid it. 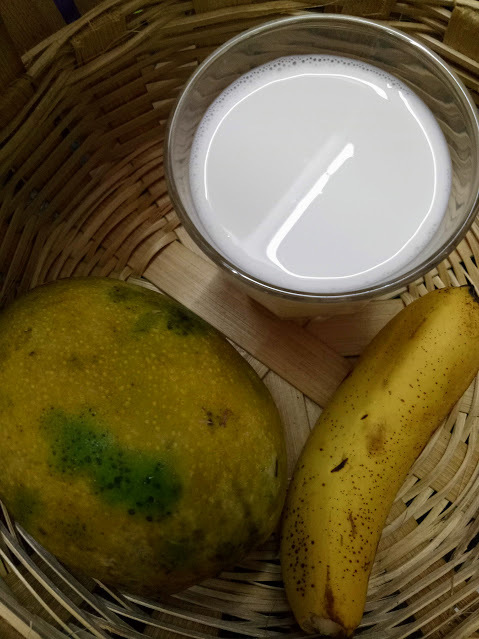 Enjoy the natural sweetness and goodness of the fruits. 1. Soak two big tbsp of chia seeds in half cup water. For best results leave this overnight. 2. Take milk and mix the almond powder in it. 3. Add chopped dates, cinnamon powder and dates. 4.Blend this in a mixer for 1 minute only. 4. Now stir in the chia seeds. Pour this in small dessert glasses. 5. Top it with sliced bananas and cinnamon powder. Enjoy this chilled and see how your stomach will say a big thank-you to you. I want to narrate an incident before I start the recipe of the day. This is when l was newly married. I still remember the episode while I was buying brinjals at a vegetable market in Worli. The vegetable vendor asked me how I was going to prepare it. Baingan ka Bharta is what I replied. 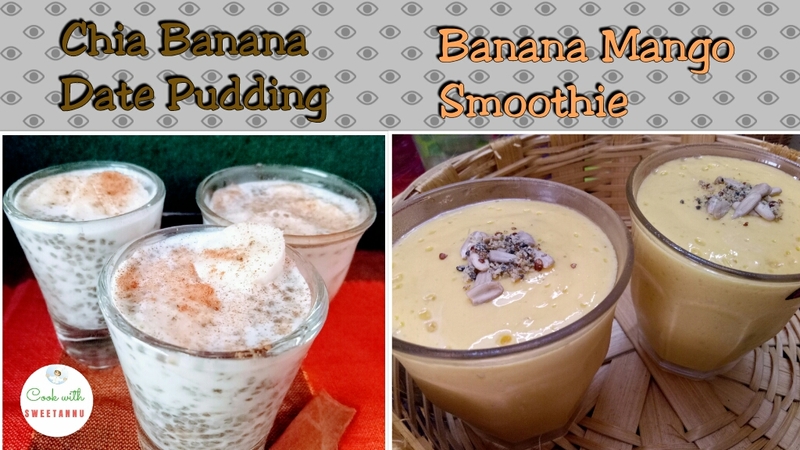 It's easy to prepare and turns out delicious, I added. She then shared a typical Maharastrian stuffed Brinjal recipe with coconut and peanuts. 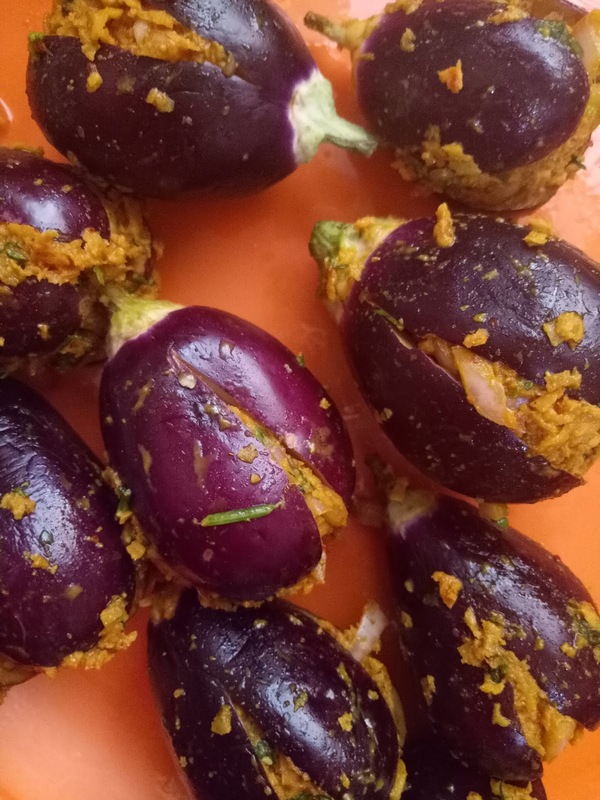 She even shared a recipe to stuff dry masala in brinjals and cook it quickly without much fuss. 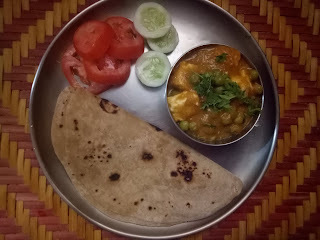 Previously I have shared a baingan bharta recipe with you. Today I am attempting to make the same stuffed version with peanuts and other spices. So let's get Cooking with Sweetannu. 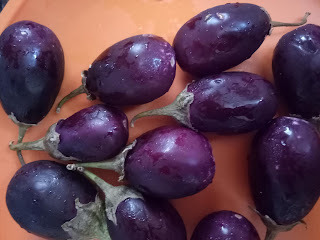 -->Wash and cut the brinjal as shown in picture, ready for stuffing. -->Take a pan, add one tbsp oil. Add onions and saute till translucent. --> Add Peanuts to it. Dry Roast until they are nicely done. --> Now add the grated coconut and ginger garlic paste to this and roast till it changes colour. --> Remove this mix in a plate. --> To this mixture add dry spices, lime, salt and sugar. --> Stuff the slit brinjals with this mixture. --> In the pan now add 2 tbsp oil, place the brinjals in it. --> Cover and cook the dish on low flame. --> You can add half a cup of water if you feel the brinjals are sticking to the pan. --> Let the water dry completely. 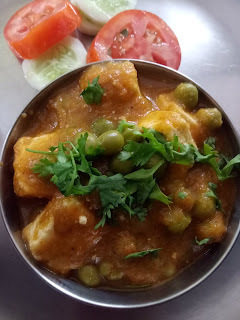 I just realized that I have posted many chicken recipes and hardly any for fish. Actually eating fish is very healthy as its low in fat. 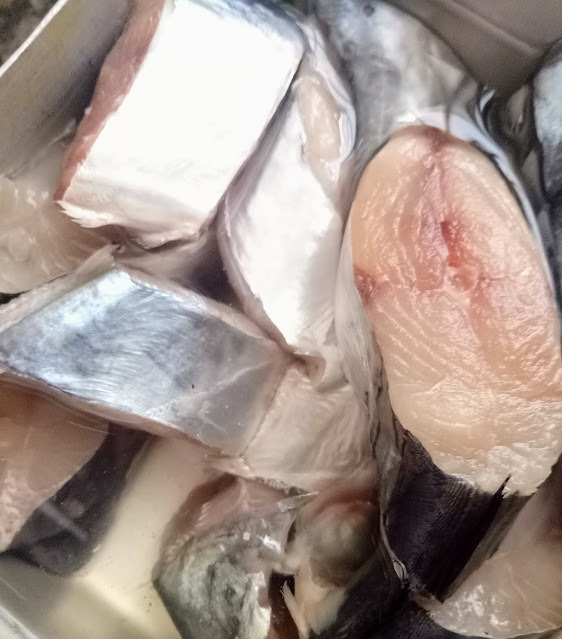 Some oily fish are a rich source of healthy omega-3 fatty acids. It's also packed with protein, vitamin B-12 and selenium. 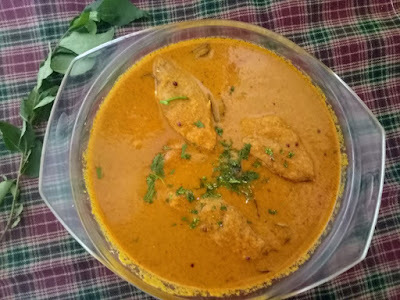 I can go on and on with its health benefits but lets get cooking with Surmai ( King fish ) and make a spicy sour curry with tamarind and coconut milk. Fish is very delicate and doesn't take time to cook like chicken or mutton. King fish has no scales, is an oily fish with only one bone in the middle. It is indeed a fleshy and tasty fish. 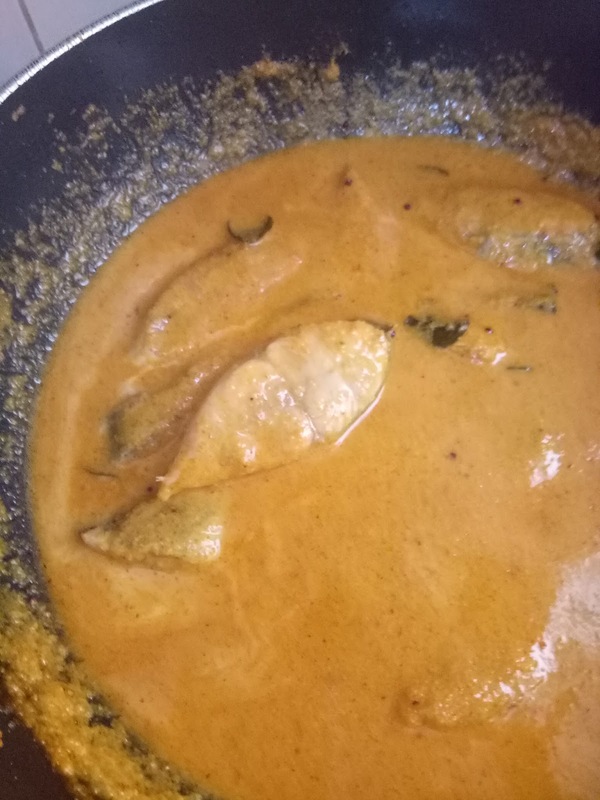 Note the ingredients this fish curry needs. It can be achieved in 30 minutes or under. Add the tomatoes to this. Let it all cook together. Now when this mixture is cool; blend it in a mixer to make a coarse paste. If needed add 2 tbsp water to blend well. Add one tbsp oil to the kadai.To the oil add mustard seeds and let them splutter. Now add the ground masala mixture to the oil and saute it for 5 minutes. Add tamarind pulp and coconut milk with one cup water. Bring it to a boil. Cook until the oil begins to separate and the gravy thickens a bit. Place the washed pieces of fish slowly and cook on a medium heat cover and cook for 5 more minutes. Serve with pride on the dining table with steamed rice, papad, salad..... and. Oh, I missed the pickle in this picture. 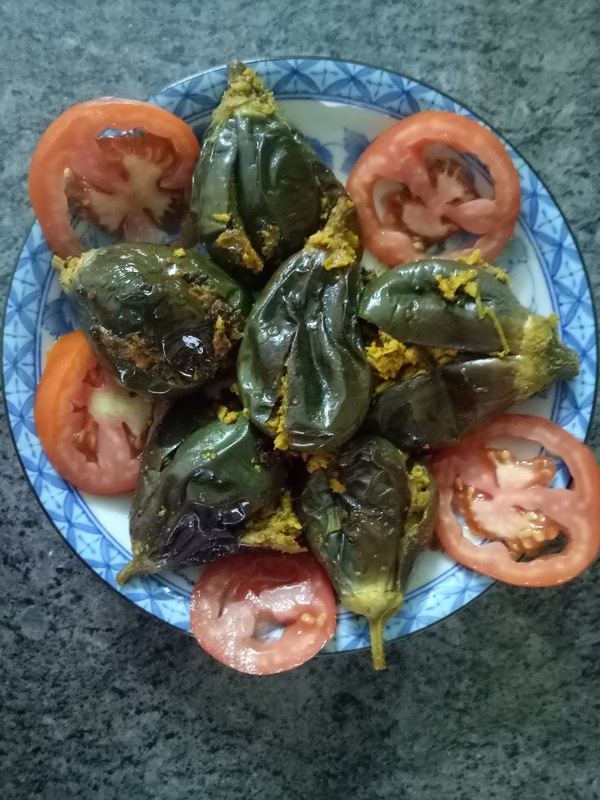 But you can add a spoonful of pickle on your plate because it will only enhance the taste and make it a finger licking experience. If you have any queries be free to ask me in the comments below.